Personal information is any information that could be used to identify you as an individual. The application asks you to enter details about your child's name and date of birth. This is used to tailor the information in the application to your needs, and to define when you will receive notifications. Your child's name and date of birth is stored on your phone only. Information about you i.e. postcode, and demographic characteristics such as marital status and ethnicity, your child's age in weeks and their age when they started weaning is securely stored. This is to enable NHS Lothian to evaluate the impact and reach of the application and improve the service. The information will not be stored in a format that could personally identify you by Brave Location UK Ltd or NHS Lothian and will not be passed to any third party. You can change your details at any time from the 'More Info' button on the home page, then the 'About your child' and 'About you' menu. You can also choose whether to receive notifications based on the information you have provided in the Notifications menu. NHS Lothian is committed to protecting your privacy and safety rights while you use the application. Brave Location UK Ltd enforces strict privacy policies and requires the publishers (Apple and Google) to abide by the following privacy practices. The application sends unidentifiable and non-personal statistical data to help Bravelocation Software Ltd and NHS Lothian improve the quality and reach of the application, and to improve support processes. When you are on a mobile device, you are at times using a third party to access the internet and/or the application. All requests must be sent through your mobile carrier's network, and the carrier may have access to it. For information about how the carrier treats your information, you must review your carrier's privacy policies. Bravelocation Software Ltd has no control over the policies that may be applied by your carrier. Bravelocation Software Ltd and NHS Lothian reserve the right to add features or content to the application at any time. You are encouraged to read the privacy policies offered by NHS Lothian and third parties before using any of their content or features. Bravelocation Software Ltd also requires NHS Lothian and any third parties which may provide you with content, to protect your online privacy rights. You will not be required to view obtrusive adverts to use the application. The application does not enable other software applications to access data stored on your mobile device. To use this application you will not need to change your mobile device preferences, modify web pages that you visit or accept third party offers. You may voluntarily opt to change or add components, accept notifications or other features from NHS Lothian. Mobile applications users can easily uninstall the mobile application at any time by using the standard uninstall process as may be available as part of your mobile device, or via the mobile application marketplace or network. You have full control over the application and can modify your preferences at any time. You can deactivate or close the application easily and at any time. 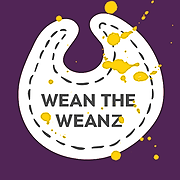 If you believe that your rights have been infringed upon while using the Wean the Weans application, please email johnp@bravelocation.com. Bravelocation Software Ltd will review your email to ensure that the privacy policies described here have been enforced.